Solovetsky Monastery. East wall with Archangel Tower (left) and Transfiguration Cathedral. July 26, 1998. The remarkable fortifications, begun under Ivan the Terrible, marked the monastery as a defensive structure as well as a religious one. At the beginning of the 20th century the Russian chemist and photographer Sergei Prokudin-Gorsky invented a complex process for vivid, detailed color photography (see box text below). Inspired to use this new method to record the diversity of the Russian Empire, he photographed numerous historic sites during the decade before the abdication of Tsar Nicholas II in 1917. Among the most remote places he photographed was the Solovetsky Transfiguration Monastery, located on Great Solovetsky Island, part of an archipelago in the southwestern part of the White Sea. Prokudin-Gorsky visited Solovki in the summer of 1916 as World War I raged in Europe. The Prokudin-Gorsky Collection at the Library of Congress in Washington, DC contains 20 photographs that he made at or near the monastery. My visits occurred in the summers of 1998 and 1999, an ideal time to see the complex, as most of the exterior scaffolding had been removed following the completion of major restoration projects. Founded in the 1430s by the monks Zosima and Savvaty, the Transfiguration Monastery flourished in the mid-16th century under the guidance of hegumen Philip (Feodor Kolychev), a Muscovite monk of noble origins. The prelate’s public resistance to acts of political terror by Ivan IV (the Terrible) during the late 1560s led to his exile and death in 1569. Nonetheless, intensive development at the Solovetsky Monastery continued throughout the late 16th-century with the construction of additional churches and monastic buildings. 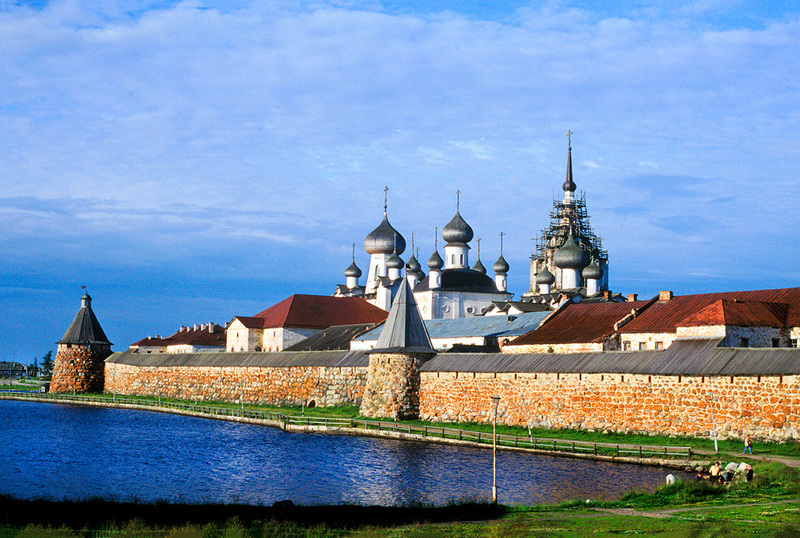 The Solovetsky Monastery is impressive in many ways. Its massive granite walls are one of the most remarkable achievements of European fortification engineering. The impulse for their construction came from Ivan the Terrible’s prolonged Livonian War, which lasted from 1558 to 1583. As part of that conflict, a combined Dutch and Swedish flotilla appeared off the Solovetsky Archipelago in 1571. Although no hostile action ensued from this probing mission, it raised questions about the vulnerability of the monastery and, more generally, of Muscovy’s northern approaches via the White Sea. In 1578, Ivan the Terrible supported the building of a log wall around the monastery and sent a detachment of streltsy (musketeers) and cannoneers under the command of Mikhail Ozerov to counter Swedish moves in the White Sea. Ozerov died the following year in a vain attempt to dislodge the Swedes from their occupation of monastery lands near Kem’, the nearest mainland settlement to Solovki. This defeat served to increase the resources allocated to the monastery. With the loss of the Baltic fortress of Narva in 1581, the strategic importance of the White Sea increased not only in military terms but also as Muscovy’s outlet to European trade. By the end of the 16th century, the entire White Sea area was linked by rivers, lakes, and the sea into a powerful trading network. Through this vast territory moved furs, forest products, fish and — that most essential of commodities — salt. In 1582, work began on replacing the log stockade with walls from the most durable available material: granite fieldstone, including large boulders. After the conclusion of the Livonian War in 1583 and the death of Ivan the Terrible in 1584, work on the walls continued with the support of his successor, Tsar Feodor. When completed, the walls formed an elongated pentagon approximately 3,000 feet long. The walls averaged 30 feet in height and some 23 feet thick at their base. During the period of most intensive construction, between 1582 and 1594, monks and hired labor manhandled thousands of granite boulders into place as the great walls and round towers of the monastery arose from the marshy ground. During the first two years of construction, work was guided by a master builder from Vologda, Ivan Mikhailov. The monastery had gained much experience in the use of granite boulders for large structures, including churches, during the 1550s and 1560s. Written sources indicate that overall supervision of the project was assigned to the monk Trifon, born Terentii Kologrivov and member of a prosperous family of salt merchants from the White Sea village of Nenoksa near the mouth of the Dvina. The enormous enterprise of building the walls was supported by sporadic grants from the Muscovite court and by the monastery’s immediate resources on the archipelago, as well as a network of settlements that had obligations to the monastery. During the summer months as many as 200 hired Cossacks participated in the building of the walls. The most distinctive elements of the walls are the six massive round corner towers. They include: the St. Nicholas Tower and entrance gate at the northeast corner; the Archangel Tower at the southeast corner; the White Tower at the west point; the Spinning (priadil’naia) Tower on the southwest; and the Watch (korozhnaia) Tower at the northwest corner. There are also four square towers of smaller dimensions. The towers, like the walls themselves, were topped with brick for gun ports, and the entire system was covered with a wooden roof, including tent forms over the towers themselves. The towers were among the last major elements of the wall system to be completed. With the signing of a peace treaty between Russia and Sweden in 1595, the urgency of completing the walls lessened. Nonetheless, construction continued until 1596, resumed again in the early seventeenth century, and reached its conclusion in 1621. Prokudin-Gorsky’s photographs of the monastery in 1916 were among the last views of the remarkable ensemble before the cataclysm of revolution and civil war. Seen here is a photograph of the east wall, above which rise church domes and spires. My photographs include a similar perspective, as well as breathtaking views across the Holy Lake. In 1992 the Solovetsky Islands were designated a UNESCO World Heritage Site. In the early 20th century the Russian photographer Sergei Prokudin-Gorsky invented a complex process for color photography. Between 1903 and 1916 he traveled through the Russian Empire and took over 2,000 photographs with the new process, which involved three exposures on a glass plate. In August 1918 he left Russia with a large part of his collection of glass negatives and ultimately resettled in France. After his death in Paris in 1944, his heirs sold his collection to the Library of Congress. In the early 21st century the Library digitized the Prokudin-Gorsky Collection and made it freely available to the global public. A number of Russian websites now have versions of the collection. In 1986 the architectural historian and photographer William Brumfield organized the first exhibit of Prokudin-Gorsky photographs at the Library of Congress. Over a period of work in Russia beginning in 1970, Brumfield has photographed most of the sites visited by Prokudin-Gorsky. This series of articles will juxtapose Prokudin-Gorsky’s views of architectural monuments with photographs taken by Brumfield decades later.